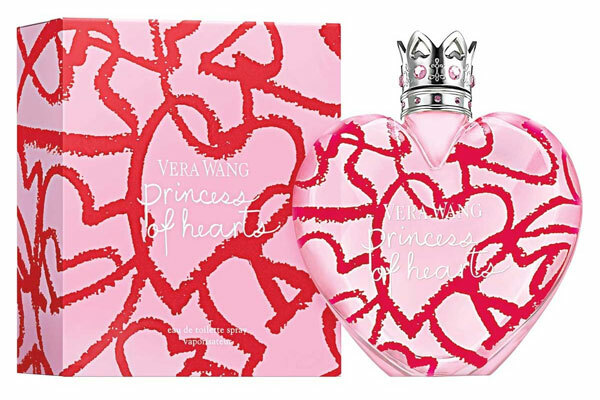 Princess of Hearts by Vera Wang - A new sheer floral fruity fragrance for women. This exuberant watermelon and strawberry version of the original Princess perfume celebrates life and love. Just in time for Valentine's Day, this bright and fresh perfume is housed in the original Vera Wang Princess bottle decorated with whimsical red crayon hearts, a pink juice, and pink gems adorning the silver crown cap. The top notes include fruits, with a heart of white florals, and a finish of vanilla, musk, and cedar. Princess of Hearts was launched in January 2017 and is available in an eau de toilette spray at Kohl's. Package Design Original Vera Wang Princess perfume bottle with red crayon hearts and pink juice.